Status: Rare casual fall visitor. Documentation: Description: 29 Aug 2007 adult male Cedar Co (Brogie 2009). 23 Sep 2017 adult male photographed Copper Dollar Cove, Plattsmouth, Cass Co.
A well-described adult male Magnificent Frigatebird on the Missouri River near Goat Island, Cedar Co 29 Aug 2007 (Brogie 2009) was determined to be in Nebraska waters at least some of the time during the observation. Around the same time there were several sightings in northeast Nebraska 28 Aug-8 Sep 2007; these brief sightings may have all been of the above bird, and coincided with the observations of an adult female Magnificent Frigatebird in northwest Iowa 2-3 Sep (Dinsmore and Gilliam 2008). The first report in Nebraska in 2007 was one photographed near Norfolk, Madison Co 28 Aug (Brogie 2008). 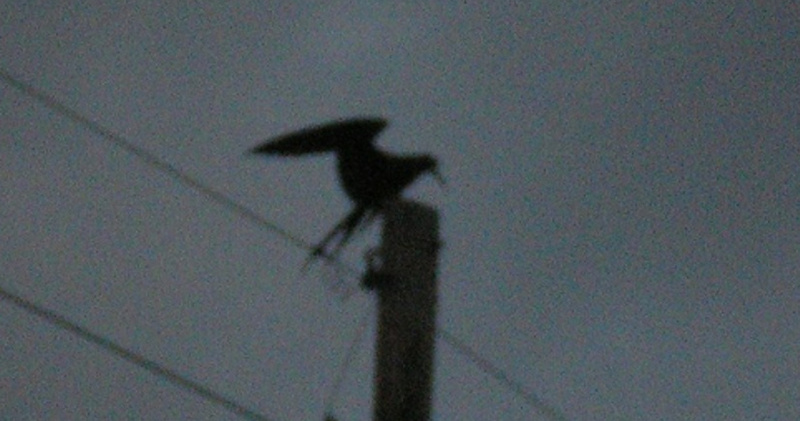 Although clearly a frigatebird, no coloration other than black is visible in the rather distant photograph. Then followed brief sightings of apparent frigatebird(s) on Lewis and Clark Lake, Cedar Co 7-8 Sep (Silcock 2007), and a report of an all-dark bird with a forked tail below Gavin’s Point Dam 8 Sep (Brogie 2008). A report was received with photographs by Traci Strazdas of an adult male that had been at Copper Dollar Cove, Plattsmouth “a couple weeks” through 23 Sep 2017; it was likely a product of Hurricane Irma, which hit the Gulf Coast around 10 Sep (Silcock 2017, NBR Fall Field Report in press). Comments: Most North American Interior records of frigatebirds result from these birds’ being carried inland by Atlantic hurricanes or tropical storms, and then drifting northward. Few storms are powerful enough to reach Nebraska, which explains the paucity of records. Tropical Storm Erin reached Kansas as a tropical depression 17 Aug 2007, likely the vehicle for the Nebraska frigatebirds that year, as well as an adult female Magnificent Frigatebird in northwest Iowa 2-3 Sep 2007 (Dinsmore and Gilliam 2008). The occurrence of Great Frigatebird (F. minor) in North America was discussed by Howell et al (2014); there are two California records, Oct 1979 and Mar 1992, and a remarkable adult male specimen collected in Oklahoma Nov 1975. Howell et al (2014) surmised that the Oklahoma bird had been wind-driven, perhaps across the isthmus of Tehuantepec, Mexico into the Gulf of Mexico. It is norteworthy that there is only one Great Plains record of Magnificent Frigatebird as late as Oct, that in Oklahoma (eBird.org, accessed December 2017). Photograph (top) of a Magnificent Frigatebird in Madison Co 28 Aug 2007 by Bruce Trindle. Dinsmore, S. J. and J. Gilliam. 2008 Magnificent Frigatebird at Spirit Lake. Iowa Bird Life 78: 49-50.